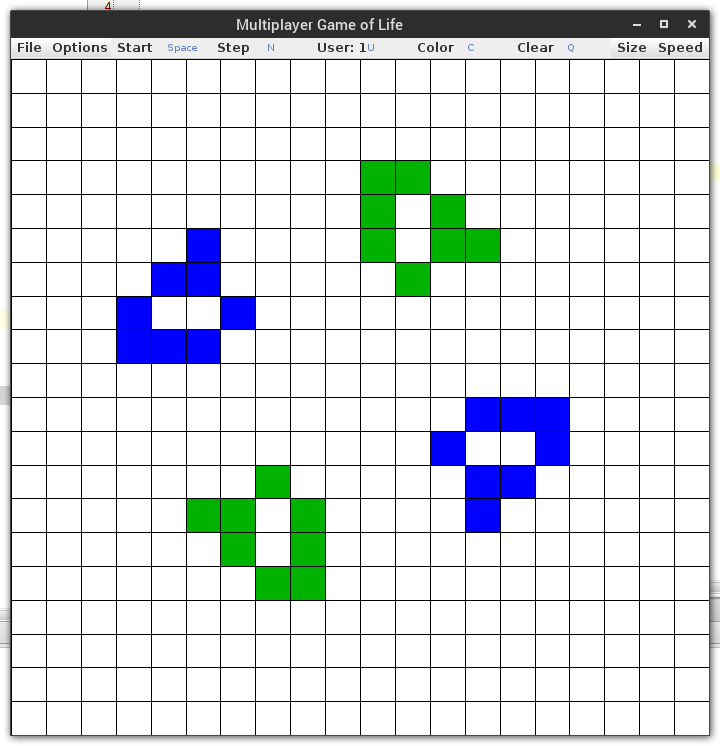 The Game of Life, also known simply as Life, is a two-dimensional cellular automaton devised by the British mathematician John Horton Conway in 1970. The idea is that every cell in a square grid has one of two states, dead or alive. A cell can become alive if it has three neighbors, but dies if it has more than three or less than two. The result is a pattern of cells which mimicks how simple life forms react to isolation and overpopulation. In this particular version, I have worked on creating a new rule and twist to the game. I have created a “multiplayer” version where the user can define a second “species” on the board along with the first. The new rule is part of the reproduction rule where if a dead cell is touching three living neighbors, it becomes alive due to reproduction. Instead of the dead cell just coming to life, it takes the form of whatever species acounts for the most individuals out of the three living cells. In these situations, the two species have competed, and one has taken over the territory over the other. This allows the user to experiment with competition in the game. You can create systems and see what species wins the most territory, takes over another, or you could see if you can create a mutualistic relationship where the two species help each other survive. This program is also an implementation of Coway’s game that allows you to draw upon years of research by downloading interesting patterns from bitstorm and using these patterns in your game. Also, you can save any grid you like and use it later on in the same manner. The world of Life has boundless shapes and patterns, each of which has its own unique evolution, behavior, and interaction with the shapes around it. Go ahead and start up the program and give it a try. You can toggle the state of a cell by clicking on a cell (oscillates between dead and alive). You can change the current species you are editing by clicking the user button in the menu bar. As you are editing a species, you can press the Color button on the menu bar to change the current species’ color. The size of the grid can be controlled throught the size menu. By selecting the start menu item, you can toggle the game on and off and watch the population that you have defined evolve. If you want to see each individual step, you can prest the step item and the board will move forward a single generation. The speed menu controls the speed at which the animation plays. The open item allows you to open an existing .cells file that you have either created or downloaded from bitstorm. The save item allows you to save the current board as a cropped down shape for later use, or for sharing. The quit item exits out of the program. The second strain item allows the user to choose which new rules are to the second cell strain. The reproduction rule affects when dead cells turn on, whether or not they are first or second strain. The kill rule affects whether a a cell surrounded by two or three cells only of the other strain dies or not.